While it does get you thinking about your posture, the Lumo Lift's lack of meaningful data means mixed messages and un-actionable goals. A novel design it might be, but this is more novelty than necessity; this is a wearable device to borrow, not buy. You slouch. We all do. You need a wearable device that coaches you to sit up straight, right? 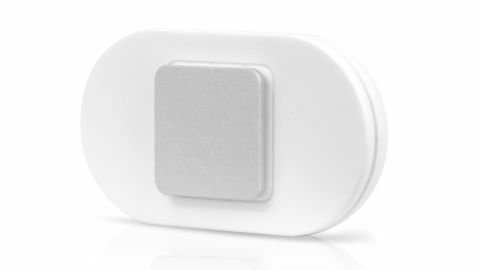 In your absence of self-control (or possibly your lack of interest), the tiny Lumo Lift vibrates each time you slouch. Its small size is best understood in terms of what came before; the same maker's Lumo Back posture belt from a few years ago. This was a back band with a sensor that had to be worn around the lower back and core under clothes, and it gently vibrated when the wearer slouched, while an accompanying smartphone app gave a live graphic of posture, and it also counted your time spent sitting, moving and sleeping. Lumo Lift is a reaction to that device's key problem; it was an unwieldy and almost unwearable wearable. Uncomfortable and inconvenient it may have been, but can its streamlined replacement – which weighs barely 13 grams and clips onto clothes – offer the same accuracy? It's an easy set-up; you enter your weight, height, name and email address into the app, then clip it to a shirt, t-shirt or bra – crucially, in the area just under the collar bone – and use one of the (very) magnetic clasps (there are a dozen multi-colored clasps included) to keep it there. You need to align the sensor each time you change position. You sit down at the keyboard, get comfortable and, with your back straight, double-tap the Lumo Lift. It buzzes thrice in acknowledgement. In the first two hours of working at a desk, the Lumo Lift appeared to work well, only buzzing when I slouched forward. It even detected when I was moving into the keyboard too much, thereby forcing me to remember my touch-typing lessons and the need to keep the body completely still. But what about slouching down? This is important because posture isn't just about staying vertical. Just as damaging to the spine is hunching downwards into the chair and sloping shoulders forward slightly. Thankfully the Lumo Lift catches that movement too... at least, most of the time it does, but I have big shoulders so I'm not convinced it would work on everyone. I also found that the Lumo Lift works better with some clothes than others; if clipped to a t-shirt it worked fine, but if the garment is at all baggy or loose – as a shirt can be – it means the Lumo Lift doesn't move as the wearer moves. Slouch in such a garment and the device stays in the same position, and it doesn't buzz. During set-up using the free app for iOS or Android it 'strongly advised' me to have it buzz after 15 seconds of slouching (something it calls 'coaching'), but the advice quickly changed; with the coaching mode toggled on, it soon increased that advice to two minutes. The makers want me to notice what Lumo Lift is doing, at first, then try to prevent it from annoying me too much. That's a pretty savvy decision, but doesn't solve the Lumo Lift's core problem: it doesn't do much. The Lumo Lift vibrates if you slouch or, rather, if your shoulders lean forward. It may well use patented biomechanics monitoring sensors, but as far as Lumo Lift's 'posture and movement feedback system' goes, that's it. It buzzes, you sit up straight. Using the app you can set it to the inherently annoying three seconds if you want to be lambasted every time you even slightly slouch, or up to ten minutes. The app is similar to Lumo Back's in that it also collates basic statistics on your activity (though not sleep). However, while Lumo Back gave a live, real-time graphic about your posture, Lumo Lift doesn't, instead focusing on rewarding the user in rather meaningless ways. It gave me a goal of six 'good posture' hours, though I regularly hit ten and even fifteen hours despite being told I was 'slouchy'. Is walking around considered good posture? It's really not clear, with two days spent walking around a city rewarding me with seven hours and two hours good posture, respectively. Both days were almost identical in terms of activity. The app does at least translate steps into distance (miles). Rather oddly, it collected data for days when it wasn't used, too, at one point giving me five good posture hours when it sat on the desk all day. The app's 'trends' graph also lacks any useful insight, it's just a list of 'good posture hours' with no extra information added. I also received a weekly email telling me that my worst posture time was between 3am and 4am (while the Lumo Lift was clipped to a shirt draped over a chair). So two months in, I'm none the wiser about my posture, or what to do about it. Does Lumo Lift even need an app? I'm not convinced it does. Unfortunately, the sync between device and app can take around five minutes while it's 'getting historical data'…from yesterday. What it's actually doing is fetching from the phone's activity data. But who wants yet another daily admin task added to their digital to-do list? It needs to be super-quick and automatic. The Lumo Lift is rated as lasting for five days, which is largely accurate, though it does depend on the coaching mode you choose; more reminders = more vibrations = a shorter battery life. Lumo Lift therefore can get you through a week's work – just – or a short business trip, which is crucial since it means you don't have to travel with the (admittedly small) recharging dock. So what do you do when the battery runs out? As with most wearable devices, you put it on to charge…then forget about it for about three days. During my two-month test of the device this happened almost every week, despite it taking only two hours to refuel. If that's the curse of wearables in general, the Lumo Lift has it worse because it requires you to swap it between clothing, too. Lumo Lift is constantly risking being left on the bedroom floor attached to yesterday's clothes. During the review I even woke up one morning with a shiver…had I put Lumo Lift through the wash? I hadn't, but it did take me a few minutes to locate it on a shirt from a few days previously. What exactly is good posture? According to the Lumo Lift, it's about how you hold your shoulders; that's it. Not only am I not convinced by that, but the results from the device itself are inconsistent, unreliable and rather meaningless. Its effectiveness depends on where you sit and what you wear, but despite its vagueness, I do like the Lumo Lift. Its battery lasts for a working week, the app isn't too preachy or annoying, and it got me thinking about my posture, especially while sitting at a desk. However, the key test is this: is my back feeling better? Well, actually, it is. I'm more aware of my posture and slowly, hopefully, becoming more conscious of the way I sit. It's small, it's discreet, and the five-day battery life is just about enough to keep it relevant for office workers wanting to correct their day-to-day sitting position. Although you do get a chummy daily notification, and a meaningless weekly email filled with bizarre statistics, it's pretty light on the chasing and the haranguing. And what Lumo Lift does do well is make you aware of your posture, at least for the first few days. The Lumo Lift can sense when your shoulders lean forward. That might be an indication of bad posture, but it's not the whole story. It's very easy to fool the Lumo Lift by keeping your shoulders still, but still adopting a lazy, slumped position. You might be half-way to better posture, but the base of your spine isn't going to get much joy. Lumo Lift is so small it's easy to forget all about, and the app doesn't give nearly enough actionable insights. If posture is hard to quantify in terms of statistics, then it shouldn't bother; the Lumo Back's real-time posture analysis was much better. Not all wearables require an app, and I'm pretty sure the vibration from Lumo Lift is enough as it is. Why not leave it there instead of confusing the wearer with data for the sake of it? Either way, the US$79.99 (roughly £50/AU$140) price tag seems extortionately high. Who's going to use Lumo Lift long-term? Doing one thing well – vibrating when your shoulders drift forward – just doesn't cut it in the big wide world of wearables, and I'm not at all convinced of its scientific worth. Lumo Lift also suffers from the predictable and unavoidable fate of single-use wearable devices; it's convenient, unobtrusive, and so very easy to forget all about. The app's obsession with activity data and steps suggests that good posture is just as much to do with general physical activity, in which case an activity band is perhaps just as useful. However, Lumo Lift does make you aware of your posture, so it does succeed on some level. But this is a wearable device to borrow, not buy.